Newly licensed lawyers are a vital part of the SDCBA as the next generation of leaders in the profession and the future of San Diego’s legal community. Your first few years in practice are an exciting, tenuous time, where you begin to not only build your practice, but your professional network and reputation as a practitioner. 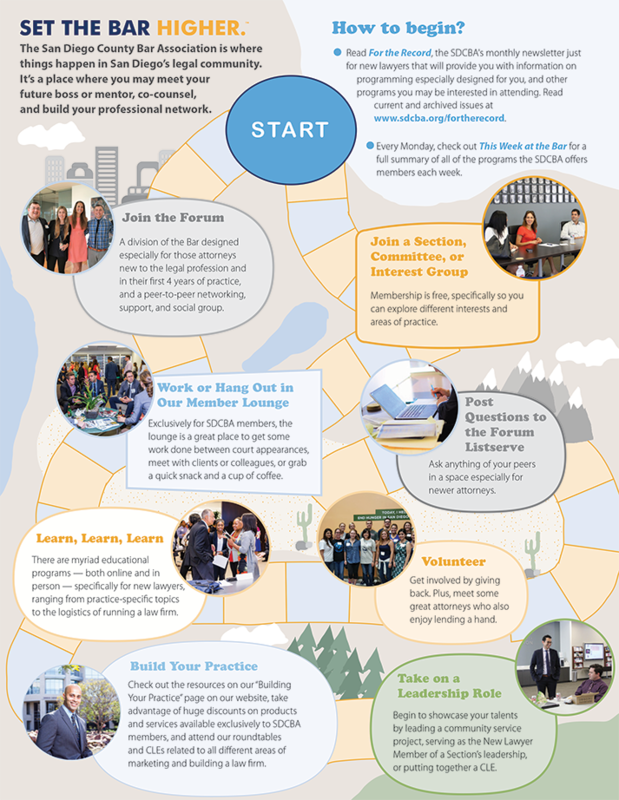 The SDCBA, as your local professional association, strives to provide you with unparalleled resources and support in order to ensure your success. The SDCBA is your link to your legal community, and to building your career and future success. Through the SDCBA, you can create visibility for your evolving practice while connecting with and learning from some of the brightest, seasoned attorneys that San Diego’s legal community has to offer. We love when our members engage, so don't miss this opportunity to get more of the Bar for less of your own bucks. BarBucks can be used towards registration fees for most SDCBA educational programs and social events. Once purchased, your BarBucks will be active in your SDCBA account and can be applied at the time of registration. Simply select the BarBucks rate during the registration process and that amount will be deducted from your total at checkout. If you do not have enough BarBucks in your account to cover the registration cost you will be billed for the remaining balance. For more information and to purchase your BarBucks click here. Fun Fact: Did you know that as a newly licensed attorney you have free membership to the SDCBA? Take advantage of all that your free membership provides and get involved today! The SDCBA’s New Lawyer Forum is a division of the Bar designed especially for those attorneys new to the legal profession and in their first 4 years of practice, and a peer-to-peer networking, support, and social group. The SDCBA has 26 sections each centered around a particular area of law. Section memberships are all free! Join a section and access its online listserve that give you information about a section, allow you to post questions and interact with others in your field of practice. This is a great way to learn about different areas of law and the practicing attorneys in the San Diego legal community. If you are interested in more project specific work, join one of our Committees or Interest Groups. For a full list of Sections, Committees and Interest Groups, click here. The SDCBA holds several networking events every month so come join the fun, meet others in your area of practice, and expand your client base. Our member lounge is free and exclusively for members! If you need a place to work in between meetings and court appearances, need to make copies or scan documents, use our private conference rooms, or simply grab a free snack and a cup of coffee, be sure to check out our Member Lounge whenever you are in the downtown area. The SDCBA produces several programs every month that are designed just for you! From substantive practice topics, to law practice management, marketing and ethics, the SDCBA offers a wide variety of affordable programs. Our new Nuts and Bolts Series, held the third Friday of each month, introduces you to a aspect of practice and is designed for new lawyers. Too busy to attend in person? Most of our programs are simulcast via webstream and can be accessed from your computer, tablet or phone. Have a calendar conflict? Our on demand options track you attendance for full credit. Check out the calendar for all the specifics. Come have fun with San Diego attorneys, judges and legal community members by giving back. Networking made easy by keeping your hands busy helping others! The SDCBA produces several premier events throughout the year that allow members to interact and engage with local attorneys and judges including our Annual Bench Bar Reception in March and our Annual Bench-Bar Luncheons in October which brings together judges and attorneys to discuss issues of mutual interest in an informal setting. Are you looking for opportunities to showcase your leadership talent? There are several opportunities available including serving on the executive committee of a SDCBA section or committee as a chair, vice chair or at large member or as the New Lawyer Member at Large being the voice of new lawyer interests to each Section's planning group. 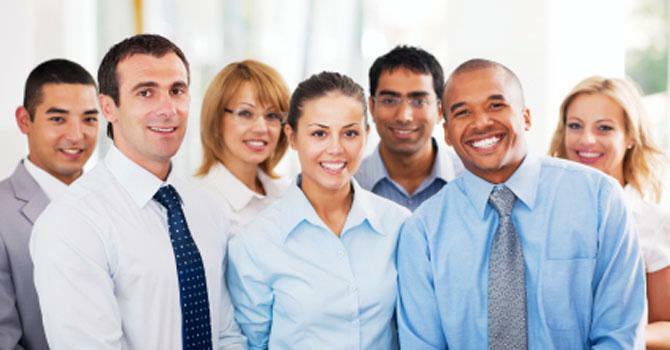 There are opportunities to help plan a CLE or spearhead a community service project. San Diego still prides itself on being a big “little” town – that means the more you engage, the more you will be seen and know. Countless new lawyers have gotten leads on a case or a position from just showing up and being seen. Read For the Record, the SDCBA's monthly newsletter just for new lawyers that will provide you with information on programming especially designed for you, and other programs you may be interested in attending. Read current and archived issues at www.sdcba.org/fortherecord. Every Monday, check out This Week at the Bar for a full summary of all of the programs the SDCBA offers members each week. All lawyers in their first 5 years of practice have access to the Fourm's listserve, so you can get questions answered by your peers and work collaboratively with others who are also new to the profession. Check out our Building Your Practice Resource Page. In addition, you can take advantage of huge discounts on products and services, exclusively for SDCBA members, designed to both to support your practice and your lifestyle, through the SDCBA's member benefit program. To review all that is available to you, visit www.sdcba.org/memberbenefits. Our “Fundamental Friday” series of programs is designed just for new attorneys. Each program, taking place at lunchtime on the third Friday of each month, focuses on the fundamentals of a particular area of practice.